The Snowy Owl is one of the hardiest species of bird in the world, living habitually with sub-zero temperatures in scrapes in the ground! This lovely, intelligent bird is also used in falconry for its fierce, swift hunting talents. 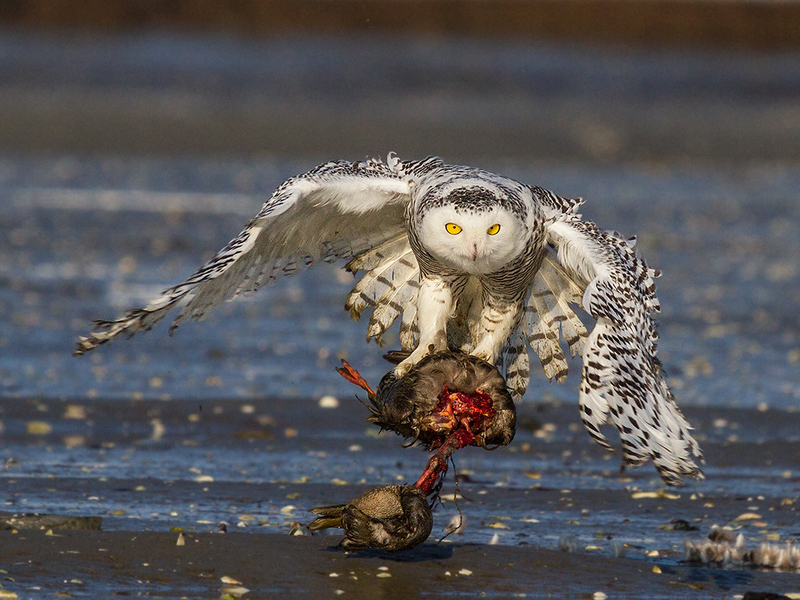 Tending to live in sub-arctic temperatures, the beautiful Snowy Owl is definitely a survivor! These Owls are not necessarily migratory but rather follow their food sources. Though they usually stay in the northern parts of North America; though on one occasion a Snowy Owl turned up in Florida! The Snowy Owls’ foods include voles, rabbits and songbirds, though lemmings are by far the preferred food of the Snowy Owl.In the spring, these Owls will steal and eat swans’ eggs! 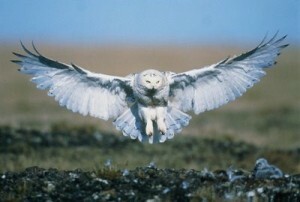 Hunting diurnally, the Snowy Owl typically flies low to the ground and descends quickly on its quarry. Sometimes these Owls will listen for prey under the surface of the snow by hopping about listening to the ground! The Snowy Owl lives in very shallow and unprotected scrapes in high, well-drained frozen ground, which it may line with feathers or a few strands of grass. The Snowy Owl hunts both visually and audibly, and thus has incredible hearing. Because it is such a fierce and solitary predator, the Snowy Owl is not often used in falconry, but despite its reputation as a snappish loner, many Snowy Owl handlers have reported imprints as having sweet natures and strong bonds with their handlers. 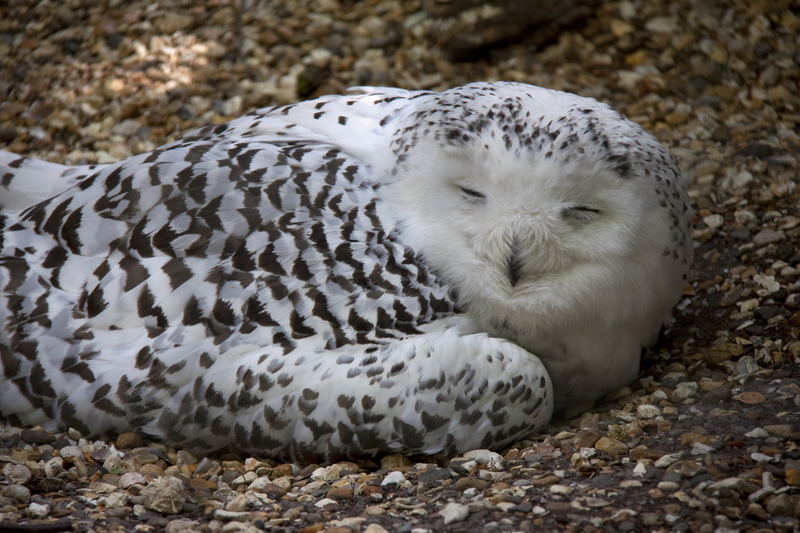 Because of their natural habitat, it is important to keep Snowy Owls in cool climes. When these birds become uncomfortably hot, they will lay face down on the ground with wings spread to try to release heat! Snowy Owls are also gregarious birds and make fine “watch-dogs”, whistling at the approach of strangers! Male Snowy Owls are pure white, and weigh about one and three quarters kilograms. Females have white faces, necks, feet and breasts, but otherwise are covered in brown or black bars. They weigh about two kilograms. 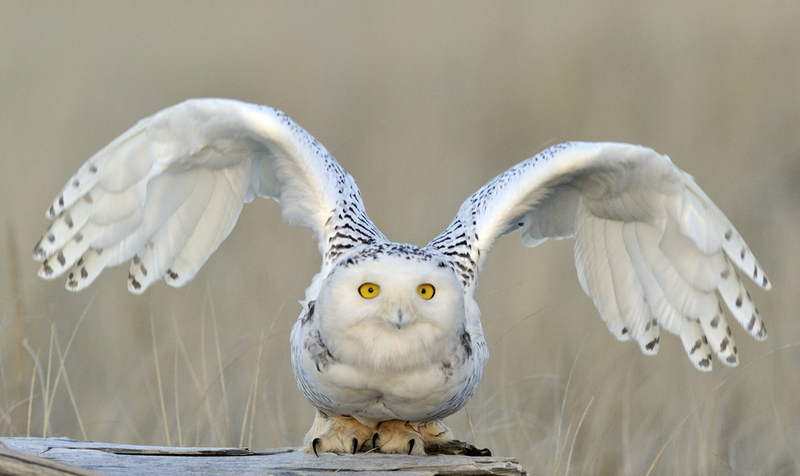 Snowy Owls measure 20 to 24 inches with typical wingspans of 54 to 66 inches. They have black beaks and lovely yellow eyes, and their legs and toes are entirely feathered. Young Snowy Owls also have dark black or brown bands and dark splotches on the tops of their heads. 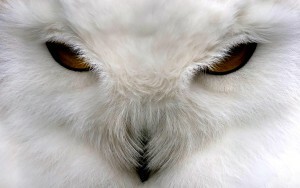 The claws and beak are sharp and hooked, and the Snowy Owl can turn its head 270 degrees in either direction. 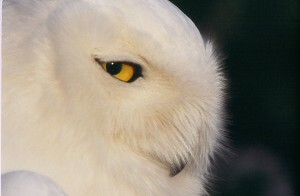 The Snowy Owl is white because its feathers lack pigmentation, which provides extra space for air between the feathers. The air acts as an insulator for the Snowy Owl. Snowy Owls generally live in open, circumpolar spaces such as the tundra and frozen lakes of northernmost North America and Europe. 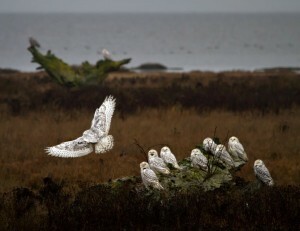 However, Snowy Owls are nomadic and will wander south after their food sources. This generally means that Snowy Owls may be found in the wetlands and prairies of Southern Canada and the Northern United States. Populations are decreasing in Europe, probably due to long-term climate change. Snowy Owls are not easy birds to handle and should only be kept by experienced falconers, but will be extremely rewarding with proper raising. Imprints are best and will often form very close bonds with their handlers, however, Snowy Owls are infamous for having headstrong or mean temperaments. 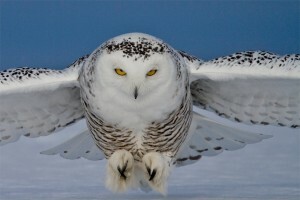 Nevertheless, many Snowy enthusiasts adore their Snowy Owls and find them intelligent and even docile. In many parts of the United States, it is illegal to own Snowy Owls. However, falconers prefer Snowy Owls to other Owls because of their sharp talons and impressive flying speed. Snowy Owls make shallow ground scrapes for nests and line them with feathers or grass. The breeding season lasts from May to June and two to 14 eggs are laid at two-day intervals. The female incubates these eggs for 32 to 34 days with the male providing her food, and the infant Snowy Owls are covered by snow-white down. At 50 to 54 days, the baby Snowy Owls will begin to have feathers and at about seven weeks will begin to fly. Snowy Owl parents are extremely protective of their infants and both participate in feeding and rearing the young.